1. What's your favorite fast food restaurant? Chik-fil-a, Zaxby's, or Slim Chicken's. So, basically anywhere I can get some quality fried chicken. I think my southern is showing? 2. Are you a day or night person? If I let myself get too off schedule I become the best night owl ever. I've done some of my best designing and personal work at night. However, I love the day time too much and always hate how much of the day I waste sleeping in on nights I stay up too late. If there's anything to be said about me, it's that I'm definitely not a morning person. I'm not sure if this counts, but I'm still in love with everything from Moorea Seal's online shop. 4. Where's the one place in the world that you'd love to travel to and why? It's a tie between England and New Zealand. Both places seem to have so many great things to see/do and a totally unique culture all their own. New Zealand looks gorgeous (I'd especially like to visit while it's winter in the US because it'd be summer there and boy am I a summer person). Plus, both places speak English. I can hang with that. 5. Who's worse: Miley Cyrus or Justin Bieber? I'm definitely going to have to go with Justin Bieber as being worse. At the very least, I can at least try to respect Miley Cyrus. Despite her at times questionable antics, I do think that she has a professionally-minded drive about her. I think she's genuinely someone trying to come into their own and is unapologetic for it, and even if I don't like what 'her own' is, I can at least respect it. Plus, her Bangerz album isn't half bad if you take it at face value. It would take too long to rant about Justin and why I think he's worse, so I'll just leave it alone. Haha. It's nothing no one hasn't said before. On that note, I can't believe I just talked extensively versus Justin Bieber and Miley Cyrus on my blog. I guess there's a first time for everything. 6. What's something that you hate that most people love? 7. What are 3 goals that you have in life? Graduate college and get a stable job in my field. 8. How would you describe yourself in 10 words or less? 9. What's your favorite TV show and why? I have quite a few favorites. I'm ridiculously devoted to Vampire Diaries. I mocked it for the longest time, but after much prodding by my friend Savannah to just give it a try, I did and ended up loving it. It's definitely a guilty pleasure show that I still get excited to watch each week. I also love my American Horror Story (Jessica Lange is everything), True Blood (hello, Eric Northman), How I Met Your Mother (never fails to make me laugh), and most recently, Orange is the New Black. This frequently changes. Different stages of life and different moods have me obsessed with different songs. However, one song that sticks out from childhood that's still just as good today is She's in Love With the Boy by Trisha Yearwood. 11. Would you rather blog with no pictures, but with words? Or with no words, but with pictures? This one is tough one for me. However, I think I'll go with sharing pictures, but having no words. I journal regularly in a private word document, so I can definitely get my writing fix there. I think sharing pictures of my everyday life on the blog with no words could create an amazingly interesting visual diary! Technically I'm supposed to nominate 11 other blogs (who have less than 200 followers) to answer questions I provide, but honestly I'd like to ask any and everyone who'd like to participate to go ahead and participate! The more the merrier, just make sure to link back here. I would love to read your responses! What is the story behind how you met someone in your life currently? What is a bad habit you possess (big or small)? What are your most frequently used expressions or phrases? What is something you're very proud of? What is the last thing your 'book-marked' in your browser? What are two or three of your favorite books? What has your favorite age been so far, and why? What is an ideal day for you? Omg, The Vampire Diaries is my show!!! Are you team Stefan or Damon? Okay, I have a pretty drawn out response to this, because as you know - it's complicated. First off, in the beginning from season 1-2 I was definitely Team Stefan (I mean, who wouldn't be given the set-up of the situation?). Today, I am definitely Team Damon and there are a lot of reasons why. I feel like Damon hasn't always been the best of guys (again, this is obvious), but he has always been upfront about his nature and has never tried to mask what he is/was, unlike Stefan who used to be Ripper for many many many years beforehand and wants to pretend like none of that's happened until he moodily relapses from time to time. Also, during his Klaus Ripper phase he was a total jerk to Elena (I know...his humanity was shut off), but it's not like he exactly came around after phasing out. Also, once Elena became a vampire and is regaining memories of things she was compelled not to remember, we discover that it was truly Damon who met her first the night her parents died. So, there's that. I feel like human Elena was meant for Stefan and vampire Elena was meant for Damon. Despite that all, I believe both brothers have pros and cons to them. So, to finish this ridiculously long reply, I'm Team Damon. Haha. What Team are you on?! Love this!! 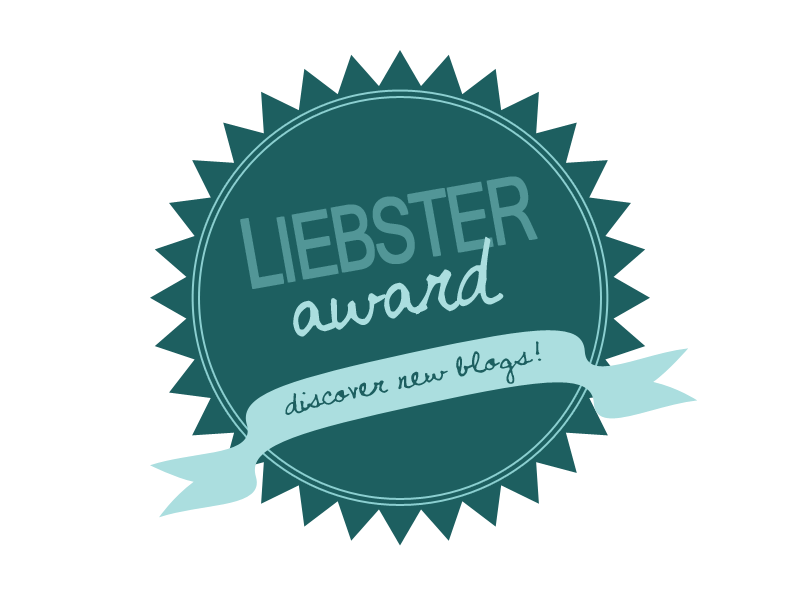 I have been seeing Liebster awards around the Interwebs lately -- such a cute idea.